After ten days of family time and visiting with Grandson Logan, I am ready for a couple of days of R & R. The goal for this first US excursion on the bike is to seek out the real ‘Coloradan’, Who are the locals? So far in Denver and Boulder I have met lots of people from somewhere else. Now I am on a mission to find the natives. 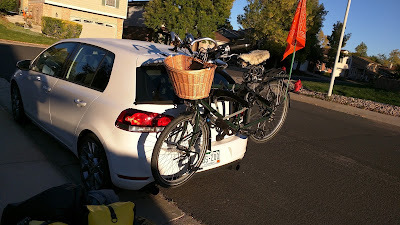 It is perhaps appropriate that this bike trip starts on the classic US holiday, Columbus Day, now mired in controversy. Colorado recently declared that ‘Columbus Day’ would be renamed ‘Indigenous People Day’ in honour of, and in memory of, the great nations that once roamed this land. The new ‘natives’ of the past few hundred years are descendants of a hardy pioneer breed of mostly European stock, that after fleeing oppression and poverty in Europe, they invaded, conquered and wrested this country from the people who lived here at the time. I park the car in Boulder, in hopefully a free spot. Google Maps leads the way out of town to the north, via bike paths that snake around and between suburban developments. I see a snapshot of working class and middle class Colorado on the way out of town. I see lots of classic 1950’s ‘Levittown’ style homes and neatly kept trailer parks. The upscale part of town seems to be elsewhere. A sign catches my eye, and I pause for a minute to chat with Scott Phillips of ‘World Outdoors’, an adventure travel company. He marvels at my cycling rig and we resolve to be in touch to see if there’s possibilities of cooperation. The weather is perfect, sunny and warm, but as soon as I am clear of the town, a winds picks up from the West, and will be a factor for the entire trip. I am heading north so have the wind blowing from my left. Any time I make a left turn, there’s a headwind that forces me to pedal downhill. Of course when the road turns east and the wind is in my back, I sail up the hills. 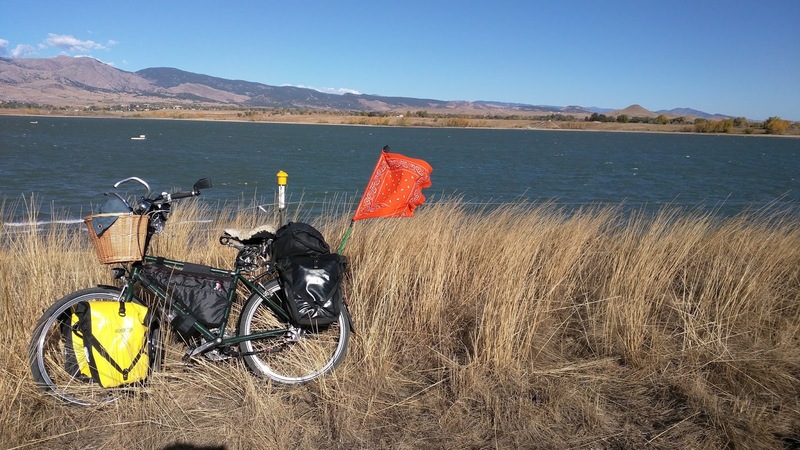 Shortly after leaving Boulder I take a detour around Boulder Reservoir, a pristine area with a great managed beach, boating and water sports. I have breakfast with a view. The ride so far is mostly on flat land or gently flowing hills. Lots of family farms, and speciality produce and animals. I see signs for ‘grass fed beef’, Llama wool, and ‘cut your own Christmas trees’. Animals are in abundance, both domesticated and wildlife. On the farms I see the aforementioned llamas, plus horses, cows, goats, pigs and rabbits. 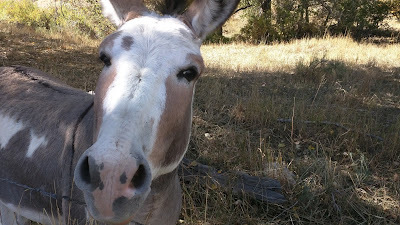 I pause and commune with one of the largest donkeys I have seen - twice the size of the ones at home. At first I thought it was a mule but on closer inspection he was definately a super-sized donkey. Only in America. Prairie Dogs are in abundance. They are small creatures, kind of like a cross between a guinea pig and a squirrel. They squeak and scurry between their burrows in the fields, poking their heads out and having a chat with each other. I also see rabbits, a rattlesnake, deer, and possibly elk. I even see a black squirrel. That was a first. There are signs warning about snakes, coyotes and bears. I am definately in Redneck country now. Pickup trucks seem to be the vehicle of choice, some with the ubiquitous rifle on a rack. I was warned about hunters since the season is now open. I am a great admirer of classic American individualism. I just have a bit of a problem with the narrow perspectives and gun fetish that seems to characterise much of white rural America. The further I go from the city, the more Trump lawn signs I see. I resolve to meet Rednecks for a deeper understanding. My first real encounter is at the Feed & Supply shop in the village of Hygiene. I need some zip ties for my tool kit and there’s no hardware shop in the village. The burly cowboy behind the counter shakes his head. “No sir’ he says to my enquiry, then goes on to ask how many I need. He can’t provide the ten or so that I could use, but he does go into the backroom and return with two zip ties as a gift. The kindness is much appreciated. A cowboy with a heart. 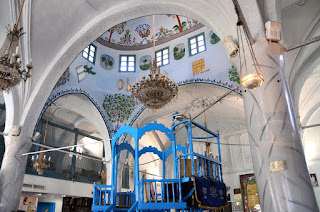 I am reminded of my own people, who fled the European and Russian pogroms, oppression, and finally the Holocaust - only to wreak death and destruction in Palestine as the land was colonised, the indigenous people displaced, and their geography, history and culture systematically replaced with a bible-based Hebrew/Jewish/Israeli ethos. 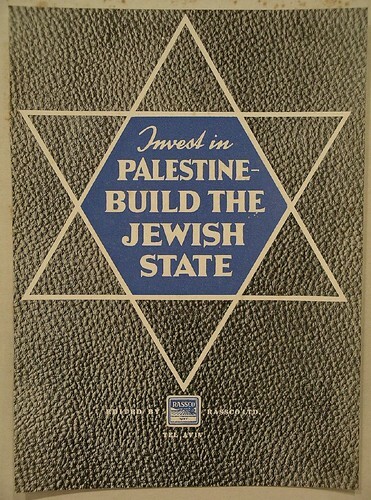 Many of us Jews are now into four or more generations in Israel/Palestine. I wonder if we now have the right to be called a ‘Native’. Ask a Palestinian. 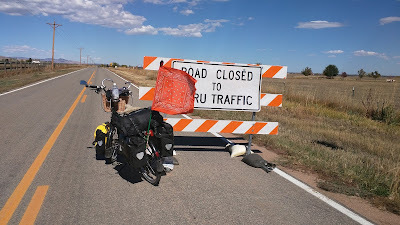 I arrive at a ‘Road Closed’ sign, and a detour indicator that would add at least another hour to the trip. 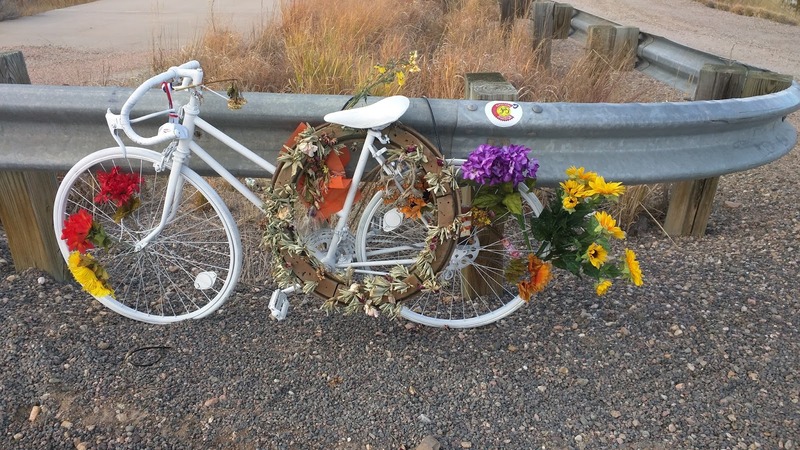 I decide that ‘Road Closed’ does not apply to bikes, and continue. A mile down the road I come to a new bridge being constructed over a river. No cars could pass, but the dirt trail bypassing the site is being used by construction vehicles. 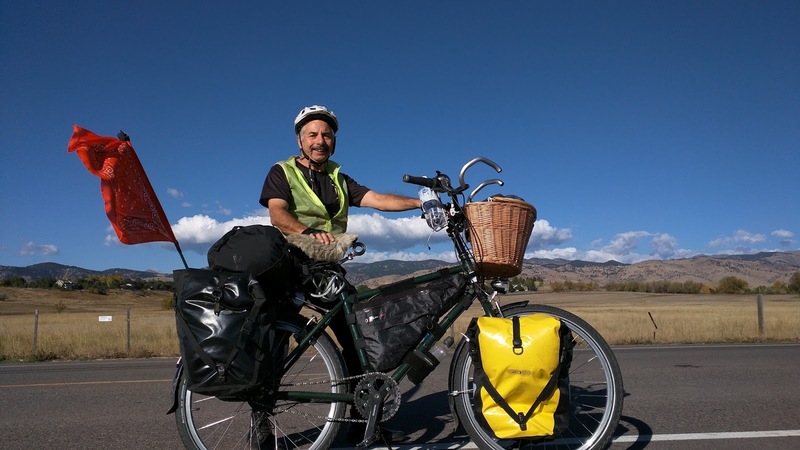 I continue on foot, pushing the bike through the slippery dirt. Only 200 feet ( 65 metres) to the road on the other side. Then a man appears and tells me that I cannot pass. “But the road is right there” I tell him. “No” he says, “County rules”, and tells me I have to go back and take the detour, adding at least 5 miles (8km.) to my ride. I try cajoling and arguing to no avail. I’m a bit pushy so he tells me that if I continue he will call the police. I ask if I can go through the adjacent private land and he tells me that I will be trespassing and the property owners have the legal right to shoot me. OK, this is getting interesting. I turn around and carefully, cautiously, enter a private driveway near the bridge. A truck is coming towards me from the nearby house. I go pro-active and wave the driver to stop. A young good ole boy leans out the window and I explain the problem. He lets loose a string of profanity about the county and the construction crew, and tells me that they have taken eight months to build the bridge that he could have built in half the time. He and his neighbours are fed up. This cowboy in a baseball cap graciously directs me to a trail through his property and tells me that it comes close to a ford in the river where I can cross. 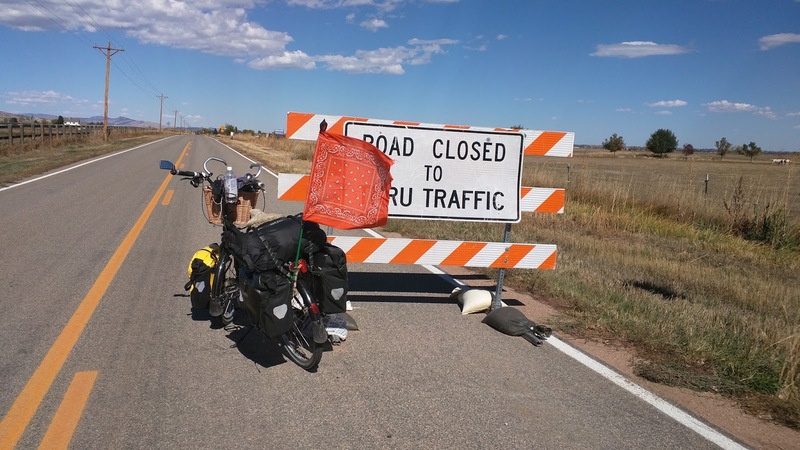 What he omitted to tell me was that there is no trail on the other side, so not possible to continue with the loaded bike. Oh well, it was worth a try. I go back and reluctantly take the detour. Between the putzing around, and the detour, I am about 2 hours behind schedule. The wind picks up and cycling becomes less fun as I have it coming at me broadside. It’s surprising that no farms seem to have wind powered generators. I guess electricity is still cheap enough around here. As I approach Carter Lake, my destination, there is a large hill with several switchback bends. I’m pretty well done for the day so take a break and ponder the steep slope ahead. Well there’s nothing for it, so I start pushing, and plow my way to the top. Half way up, at one of the hairpin bends, there’s a bicycle chained to a fence. 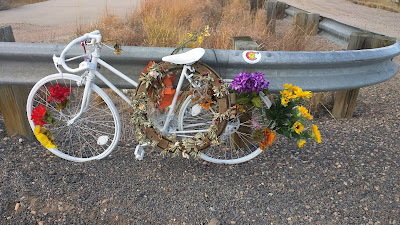 Someone has spray painted the bike white, tyres and all - and it is festooned with wreaths and flowers, obviously a shrine for someone with poor luck, poor skills, or an encounter with a bad or inebriated driver. I pause for a moment to contemplate, and move on. 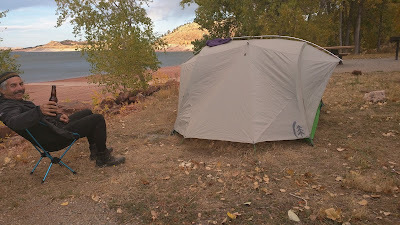 Up and over the hill I go, and after a quick consultation with the map, decide to camp for the night at the campground on the southern end of Carter Lake, rather than the northern campground that was the original plan. I’m knackered and need to stop. Not forgetting that today’s ride is at an unfamiliar and high altitude. The sun is just dipping below the nearby peaks to the West and the view of the lake is stunning. A great place to spend the night. It’s off season so there are only another couple of campers. The campground is quite basic. There’s toilets and clean water, but no showers. 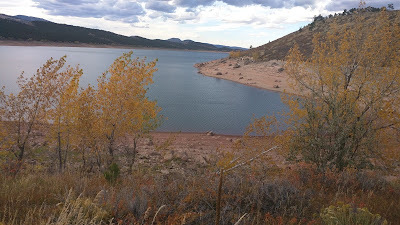 The water is the best I have tasted in Colorado. Likely direct from the mountains. There’s no discernible flavour of chlorine like the city water. I get the tent up despite the wind and cook a spicy vegan stew for dinner over my trusty Bio-lite wood burning camp stove. I sleep . . . . Thanks for sharing a great information with us.